Is there any other fruit which can match the fan following of the strawberry? Maybe not. Strawberries are so tasteful and delightful fruit that no one can say no to them. This red colored fruit is blessed with so many nutrients and benefits. Very few people know the benefits of this Strawberry fruit and others just enjoy the taste of this. 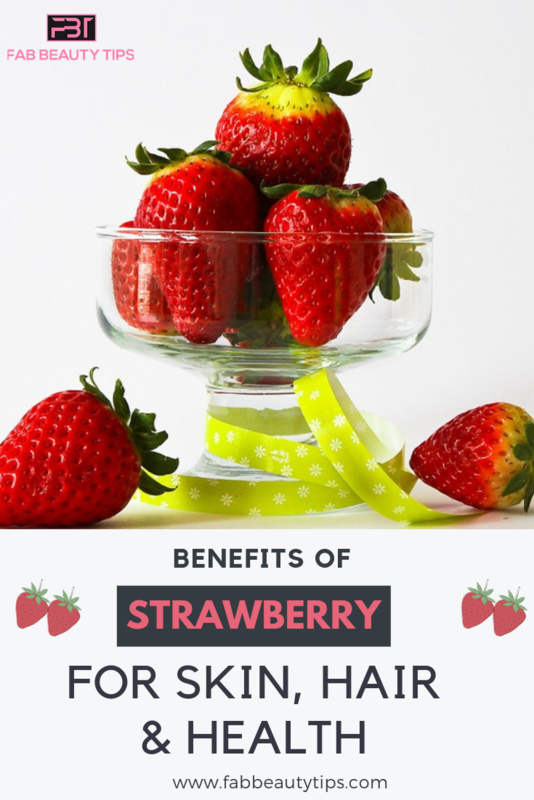 So, for those people who don’t know the benefits or those who want to know the benefits of strawberry here we come up with just an amazing listed of top 25 benefits of strawberry for you. Strawberries are of acidic nature and this is proven to be the best cleanser for oily skin but it doesn’t have any side effects if it is used by a person having any type of skin. This removes excess sebum from the skin and makes it clear and scars free. It helps in lightening the scars and blemishes from the skin and gives a clear tone. As told in the earlier point it is acidic in nature, it helps to shrink the pores and removes dirt and oil from them (Skin) also. It reduces the size of the pores and with the regular usage of this fruit on the skin, it gives a smooth finish to the face and the body too. You can apply it directly or mixed with curd on the face and on the body or where ever you feel like having pores(1). Strawberries also work best as a toner too. It helps in shrinking the pores, removing the dirt and controls the oil which every toner claims. But this fruit has done all of the work. Astringent properties of this fruit make it really beneficial for the skin. Strawberries help us in delaying the signs of aging as it has antioxidants which help in reducing the stress in the body as results in anti-aging benefits. Being rich in antioxidants it helps in reducing the appearance of wrinkles, fine lines, marks, and dark spots. Applying a strawberry face mask made with this easy and homemade ingredient is always the best idea to follow and making the skin smooth and clear. The study evaluates the effectiveness of the application of strawberry hydrolysate enriched with L-ascorbic acid using microneedle mesotherapy (2). The antioxidants and other vitamins and minerals available in strawberry make it the best for curing the acne. Strawberries are also anti-inflammatory in nature, thus this also reduces the redness and itchiness caused due to acne. You can apply strawberry paste mixed with honey on the acne and keep for some time and washed it off with cool water. Do this at least for 3-4 times a week. Strawberries have anti-oxidants and have the power to erase the acne and even the oiliness that is often present on the skin. 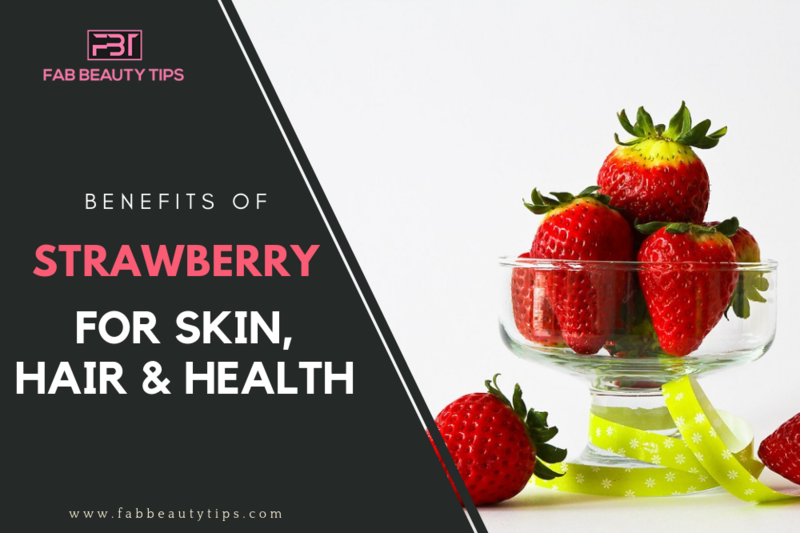 Oily skin is often the root cause of the problem and if the strawberries manage to sort that out, you will not be facing any more problems anytime soon. (3). Scrubbing makes skin smooth, glowing and free of blackheads and whiteheads. But using a market made scrub which is loaded with chemicals is not good for the skin in the long run. Strawberries are an effective exfoliator. It removes all the dirt, blackheads and whiteheads, clears the pores and also removes the excess oil from the skin. It leaves a natural pink glow to the skin. Strawberry is also great for the lips. It exfoliates them and helps in lightning them. Rubbing strawberry against the lips will helps in reducing the darkness around the lips and give a natural pink tint on lips. It contains vitamin C which helps in reducing the darkness and make lips soft and plum also. If you want a natural glow without doing much work and wasting your precious time then go to the market and buy some strawberries. Strawberries are rich in so many nutrients like antioxidants, vitamins, minerals, proteins, and zinc etc. These are essential for the skin and for maintaining the glow in the skin. Take a few strawberries and mash them. Now add milk and honey to it. Apply it on the skin and leave for 10-15 minutes. After that wash your face and see the glow you are getting in less time. Dark circles can be caused by so many reasons and getting them is easy but curing them with the perfect ingredient is really hard. But if you have strawberries then why to worry about curing? Strawberries are really great for lightening the dark circles as it contains alpha-hydroxy acids which smoothen the skin around the eye area and reduce the pigmentation. Extract the juice from the strawberries and dip a cotton swab in it. Place it on the eyes and rest for 15-20 minutes. Do this every day. Puffy eyes are other concern when it comes to beauty. It may cause due to the reaction of something, not taking proper sleep or the unhealthy habits of the person. Treating puffy eyes with commercial gels or treatments is a temporary task but if you want the good result for a long time then you have to go for natural products/ ingredients. For this strawberries can help you better. Strawberries contain alpha-hydroxy acid which helps in treating the puffiness and also reducing the aging signs. Slice the strawberry and keep it in the refrigerator for about an hour or two. Place them on the eyes and sit for 10-12 minutes. This will help you in reducing the swelling around the eyes(4). Another benefit of the strawberry for the skin is it brightens and lightens the skin. The nutrients antioxidants and vitamin C helps in brightening the skin in two ways. One is by eating strawberries and the other is by applying it on the skin. You can prepare a mask by mixing mashed strawberries with curd and honey and apply it on the skin. Keep it for some time and wash it off. Long and healthy hair is a desire every lady wants to fulfill. Strawberries are the rich source of ellagic acid and folic acid, vitamin B5 and B6, which helps in preventing the hair loss and helps in the growth also. It makes thin hair thick and boosts the health of the hair. You can apply a mask or mix the strawberry powder with any carrier oil and massage for a few minutes. Keep it for 30 minutes to 1 hour. Wash it off with a good shampoo. Many nutrients in the strawberries help in making hair healthy and remove scalp problems. Dandruff is one of them. For treating this problem strawberry are there. It contains vitamin C which fights against dandruff and removes it. Make a paste by mashing some strawberries and mix it with coconut oil. Apply it on the scalp and leave it for 30 minutes. Wash it off with herbal shampoo. Do this twice a week for some time to get rid of dandruff completely (5). Strawberries are the best for hair if we use it in the right way. It gives relief from so many scalp problems and helps in maintaining the healthy scalp and hair. Strawberries contain protein, zinc and other nutrients which helps in making hair look healthy and manageable. Application of this fruit makes hair silky, smooth and shiny. Apart from making hair healthy, strong, shiny and problem-free, it also moisturizes the hair and the scalp. To keep the hair and the scalp moisturized mix some mashed strawberries with 1 egg and apply it on the scalp and hair. Keep it for 30 minutes and wash it off with a good shampoo. Do this twice a week. The presence of antioxidants in the strawberries make it the ideal fruit for improving the heart health and it protects the heart from several diseases. Eating strawberries daily will help in maintaining the health of the heart and its functions. “The sooner people start the type of diet that includes a higher intake of blueberries and strawberries, the better,” Dr. Rimm says (6). Strawberries also help with weight loss. The presence of ellagic acid and antioxidants helps in reducing the weight without doing any harm to the body and also without affecting the health. It is an ideal fruit for the people who want to lose weight but without compromising with their taste (7). Strawberries also help in regulating the high blood sugar levels. It helps in absorbing the starch and sends them to the needy part of the body. It also helps in maintaining the health of the pancreases which is the main part for circulating the sugar to the whole body (8). Strawberries help in boosting the memory power of the brain and also helps in protecting the brain cells from damaging. And all this is done because of the antioxidants. Antioxidants fight against the free radicals which damage the brain cells (9). No matter if the blood pressure is high or low is always cause damage to the body. Strawberries are rich in potassium which helps in controlling the blood pressure and lower the chance of the damage. Strawberries are a rich source of bioactive compounds and its total antioxidant content ranks third among all fruits and vegetables. Hence, the purpose of this study is to bring forth evidence that incorporation of strawberries into the diet will reduce blood pressure and improve cardiovascular function in pre- and stage 1-hypertensive postmenopausal women (10). Strawberries being rich in vitamins, minerals and other nutrients help in making the eyes healthy and improve the eyesight. Eating strawberries daily will make your vision better. Studies have also found the antioxidants in berries reduce the risk of macular degeneration, cataracts, and other eyes diseases (11). Strawberries are loaded with anti-inflammatory properties which helps in lowering the inflammation caused by any reason in the body. Eating 5-10 strawberries daily helps in fighting against the inflammation. Another health benefit of the strawberries is that they also help in making the teeth white. It contains malic acid which acts as an astringent and removes the layer of the plaque, which causes the discoloration of the teeth. Rubbing a piece of strawberry for 2-3 minutes daily will help you in whitening your teeth. Vitamin C and antioxidants also act as an antifungal agent. It helps in curing the fungal infection in the body. Make a smoothie of strawberries and mint. Drink one glass of it daily for a few weeks and see the results. Healthy nails are always welcome. Strawberry has folic acid and vitamin C which are essential for the growth of healthy and shiny nails. Eating and rubbing strawberries near the cuticles helps in making the nails strong and long. Can strawberries help you sleep? According to experts at the National Sleep Foundation, strawberries contain very high levels of antioxidants which can protect you from the stress of a sleep disorder and cause oxidation in the body. There are June bearing, everbearing and day-neutral strawberries, each with a different time and duration of fruiting. No. When we ate strawberries before bed, our complexion was more even, more radiant, and glowing the next morning. The fiber in the fruits helps in digestion and even can aid fat burning. Strawberries have twice the Vitamin C as many other fruits. So, these are some benefits of strawberry and to get all amazing benefits of strawberries go to market and buy some now. Do leave your comment below and let me know how this article helped will you and do share it with your friends too. I have tried using strawberry for skincare and gives the really awesome results. It is one of those easy peasy skincare ingredients from the pantry. strawberry is one of my favorite fruit but still i was not aware of it’s benefits for skin,ow will surely include this in my skincare too. thanks for sharing. This is a wonderfully informative article, Roshni. I knew that strawberries provide a beautiful glow on the skin, but I did not know about all the other benefits. Good to know that strawberry not just looks and tastes great but also has such amazing benefits. Quite a helpful post this is. I love strawberries… They are so yummy! I had no idea that they are good for puffy eyes, acne and even dandruff! Will surely use them to treat my hair issues! Wow so many benefits of strawberry to maintain a healthy skin. I didn’t know that it worked well for the links and cuticles too. Thanks for sharing all this information. I am going to include strawberries in my diet regularly from now onwards. I was not aware of its benefits for hair. I love eating strawberries and have used it as scrubs and masks with very good results. I never loved strawberry ever.. but your post indeed amazed me its benefits. I m surely going to include Strawberry in my daily routine and try to make most of its benefits. I love to eat strawberries and they have so many Benefits. They are so healthy and effective for skin, hair and health. But I didn’t know that there are 25 benefits of it. I’m definitely going to share this with my friends and family. Wow I didn’t know strawberries are so useful in skincare. I will surely try strawberry for my skin care next time. I love chewing on some strawberries because they are so yummy. Now after reading your post I will make sure to indulge in some every day. Thanks for this informative post. I have open pores near cheeks so I think I will try this DIY with curd and strawberry for sure. I think on regular use it should be effective.